Traditional wiring cables generally require careful layouts with separate power and control wiring, which adds to the bulk of jobs and required space during installation. Metal-clad cables and luminary whips are specifically designed to reduce costs by integrating all necessary connections in one protective armor. Using this type of electrical cable is already a step-up for your business in terms of cost savings. But there’s another strategy to make your wiring even more cost-effective. Prefabricated cables and whips are much more efficient to use than massive cable rolls that have to be cut and prepared on-site. Off-the-rack electrical cables serve many purposes, but they inevitably leave trimmings and extra cords. Not only do they require additional costs for disposal, but they also represent a portion of your purchase expenditures that you have to throw away without any returns. You can get rid of this inefficiency with cables that are customized for your required length. This is a cost-effective strategy that minimizes wastage and delivers other efficiency benefits. USESI uses cutting edge tools to cut your power and control lines into the right size, then integrate them into a luminary whip or clad and them in metal armors for optimal protection. Getting rid of extra coil lengths that you don’t need makes your components easier to transport for installation. All the prep works are done on the prefabrication floor so that they’re ready for installation once they get to your work site. Your team can save time on cutting and fitting so they can get straight to the important tasks. Pay only for the exact yardage that you require, so you can cut down or nearly wipe out your waste disposal expenditures. Aside from that, zero-waste promotes a more sustainable model for your business. You can safeguard your long-term growth while contributing to environmental sustainability. Prefabrication Facilities are equipped with advanced cutting and measuring equipment for precise and consistent customization with no errors, even for assemblies requiring hundreds of pre-cut metal-clad cables and whips. The same level of efficiency is hardly achievable with manually-prepared cable assemblies on-site. Installation for metal-clad cables and luminary whips can be a massive source of cost savings for your business when you approach it with the right strategy. 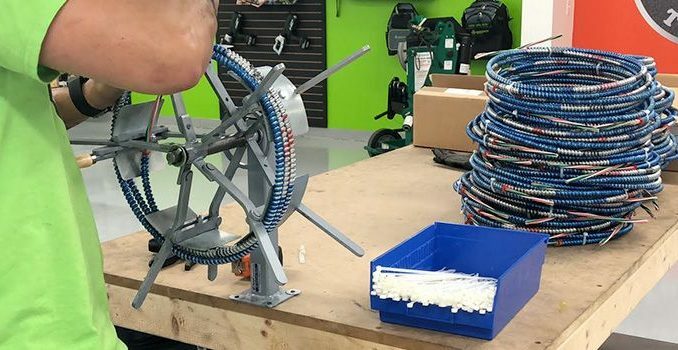 Assigning cable cutting and preparation jobs to a prefabrication facility ensures you get consistent quality without the costly inefficiencies of traditional cable and whip preparation.